As an adult I only saw him once a year and of course now I am wishing it was more. As I was grieving I began to think of all the wonderful memories I have of him. I felt the need to choose gratitude for the many years I had him in my life. Letting me watch "Halloween" at far too young of an age. At the time I felt so cool. Introducing me to Fairy Tale Theatre, and always having a vhs tape full of episodes for me to watch when I came to visit. Always saving me his cigarette boxes. He smoked a brand of cigarettes that came in a blue box. He saved them for me because I liked to collect things and he knew I could hold my little collections in those boxes. Schooling me on the whole "Blair Witch Project" thing. I'm super grateful for that because I'm sure I would have thought it was real. That would have been embarrassing. Helping with the Christmas puzzle every year even though he knew there was a piece missing and it would drive him crazy. Teaching me how to play Yahtzee while simultaneously explaining the statistical improbability of me ever getting a "yahtzee". Always having his bag of "goodies". Whatever I needed, it was in there. Toothpick, nail clipper. clothes hanger, band aid or any kind of medication. You name it, he had it for you. Sharing his big loud laugh, I will never forget it. And even though tears are streaming down my face, I'm grateful. Grateful I had the privilege to know him and to love him. After losing loved ones this year, I know that writing out your love and gratitude for them is such a great way to receive piece. Blessings to you and your fam! So sad to hear of Uncle Carl's passing so suddenly. I'm sure he knew he was a loved favorite and enjoyed being a part of your life. Praying for peace, comfort and strength for your fam especially over these next few weeks. Love and Hugs! praying for you, friend. for peace and comfort and an assurance of His arms around you! He sounds like he was a blast. Cherish those memories. My heart is with you. Im so sorry for your loss. He sounds like an amazing man and what a blessing to have such a fun uncle growing up. I'm so sorry for your loss Jami. How blessed you are to have such wonderful memories and the strength to choose to focus on those. Praying for you. My memories of Carl are also also touching and funny at the same time. We had moved to MO while I was in 9th grade, of course being from CA, I felt like I was the only cool girl in a school full of hicks. (I actually was) I was into the hippy thing and no one else was yet...Carl and Goog came to visit, Carl had long hair, smoked and was just the coolest looking guy ever. He had this floppy leather hat that he wore. I used to have him take me all around town so people would think he was my boyfriend. He also had to babysit us, I don't remember the circumstances but over the course of the week, between he, Fred and I , ran out of food money. So we took what little we had left and we bought Pepperidge Farm choc cake. He had the best taste in music, I also remember that he had a record player in his car, I thought he was the coolest guy ever. Farewell Carl, I am heartbroken for all of us but especially for Diane and Kathleen. I love you more than you'll ever know. praying for you today! loss is never easy...what joy we can have knowing that this life on earth is not the end! I am so sorry for your loss. Praying for you and your family. oh i'm so sorry! so sweet reading these memories. 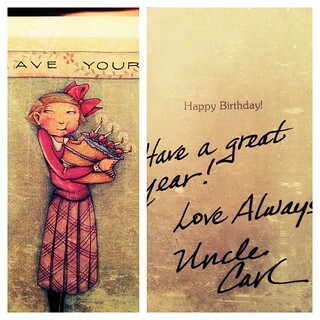 :) you had a very special uncle! just stumbled upon your blog, so sad for your loss :( but thank you for your reminder of truth in this post. You've been on my mind girl. Thinking of you and your family. Hope your having a relaxing Memorial Day weekend.